When I started my path as a UX Designer, I worked on a couple of design projects and do some redesigns of some popular companies. 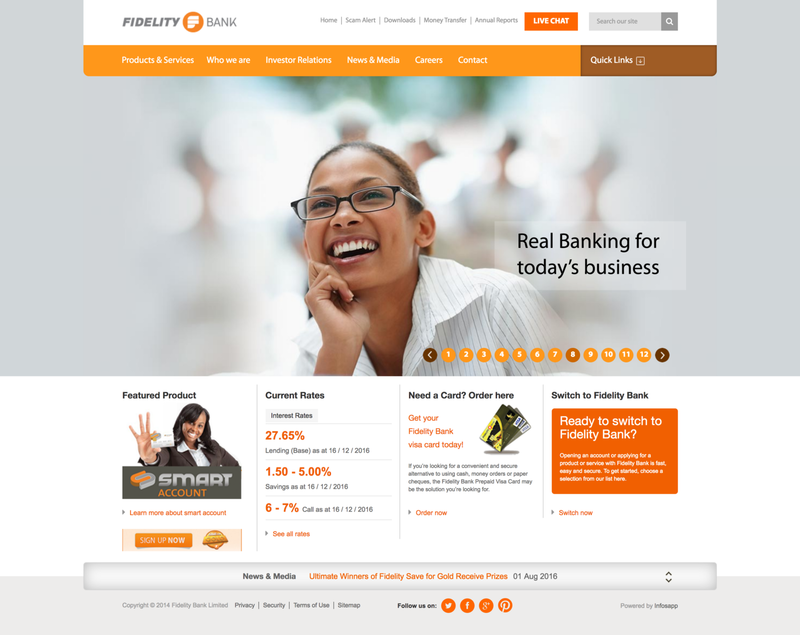 At the time, I had a Fidelity Bank account and I was not particular excited with their website design. In some instances, I felt like it never really showcased things that customers like me would need if I ever visited their home page. So I decided to redesign their site with a focus on a better user experience and display of relevant information. Below are features which I highlight that I think Fidelity Bank might consider adding to their future website. When I was in college in the US, I had a Bank Of America account. Occasionally, I would go to the website for one thing: To check my bank account. One thing I don’t like about the current Fidelity Bank website is the huge carousel. I mean, it has 12 images which don’t really give you anything. It’s really just a bunch of pictures. If you have a carousel, you need to put into actual content that the user might find useful and not have so many images which don’t offer much. Taking all that into consideration, I came up with a new look for the Fidelity Bank website. First of, I put in a “Sign On To Your Account” login menu. Fidelity Bank has Internet Banking and menu makes it easy for customers to login into their accounts to check their balance and access other services. It has an option for an existing customer who does not have an internet banking account to sign up and create one. I also redid the carousel. The first images has some copy which welcomes the customer and puts emphasis on believing in the customer (taken from the Fidelity Bank “Who We Are” section). It has a call to action button “Open An Account”. Eventually, banks in Ghana will allow customers to sign up for banking accounts online but this is a start. 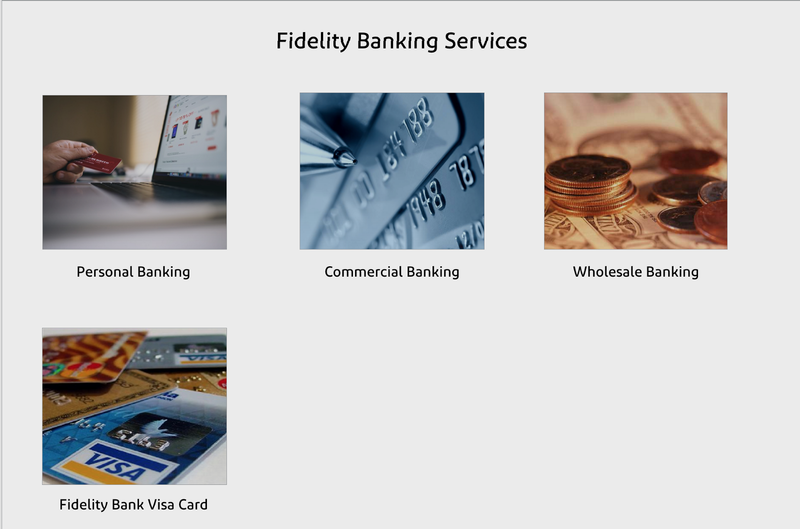 On the current Fidelity Bank website, the bank’s products and services aren’t shown or highlighted on the homepage. In the redesign, I made some of the bank’s products and services front and center. After that section, there is a small section displayed for showing the current rates at the banks. 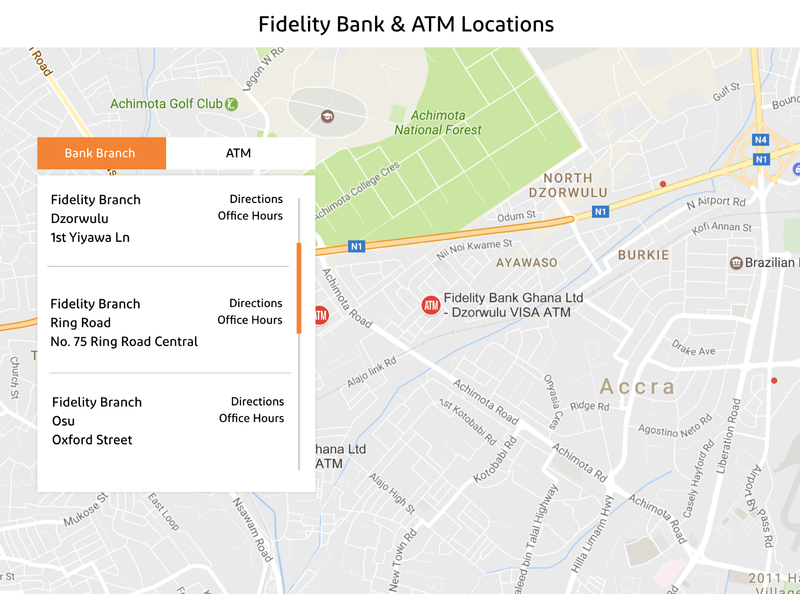 Lastly, there’s a section for displaying all Fidelity Bank branches and ATMs. There’s a menu which has the options for displaying directions and office hours. And that’s it. Below is the full home page for the Fidelity Bank website redesign. Hopefully, more banks and businesses should be designing their websites which highlight their core services more. I think Fidelity Bank should consider redesigning their websites which focuses more on their services and not have that large carousel. It doesn’t serve much purpose. I also think there should more emphasis on online banking. With mobile devices in the hands of millions of Ghanaians, having a bank which has a good web presence is very key. It can attract more customers because they will value the convenience.